With more and more choices available today, it can be confusing for the average homeowner to know what their options are when it comes to sprinklers. Proper system design is essential in order to achieve the best results for your investment. Art Plumbing, AC & Electric has years experience in designing and installing sprinkler systems. We are trained and licensed in installation, service, and the maintenance of irrigation systems, and we have an outstanding history of customer satisfaction since 1983. We’re known for the prompt and efficient service provided by our entire team of plumbing professionals – from our receptionist, to our owners, field technicians and managers. If you’re looking for irrigation system design, maintenance, or repair, you’ve come to the right place! Art Plumbing, AC & Electric offers the very best in lawn sprinkler maintenance and service. We check for any potential leaks, broken sprinkler heads and lines, clean and adjust sprinkler heads and zone valves, test, adjust and set your time clock, test and adjust your pump system, test and adjust the coverage of all your sprinkler heads, and get your lawn and landscaping looking great. We keep your lawn sprinkler system tuned-up and operating at peak efficiency so you are saving money and doing your part to help conserve our most valuable resource. We will correct any issues or problems – FAST – Guaranteed! NO MORE BROWN SPOTS or DRIED OUT LANDSCAPING! Art Plumbing, AC & Electric’s team of plumbing service experts repair, maintain and replace all types of lawn sprinkler systems (city water, pumps, well systems, and canal systems), no matter who installed it or when it was installed. Our licensed lawn sprinkler service technicians are the most knowledgeable and experienced, and equipped with a virtual rolling warehouse of the best tools, supplies, and parts. Because our trucks are so well stocked, we can make almost all sprinkler repairs on the spot fast – on-time and on budget. We offer flexible scheduling so that you can pick a time that’s convenient for you – On Time at Your Time! Art Plumbing, AC & Electric has been a family run business committed to excellence in service for over 32 years. 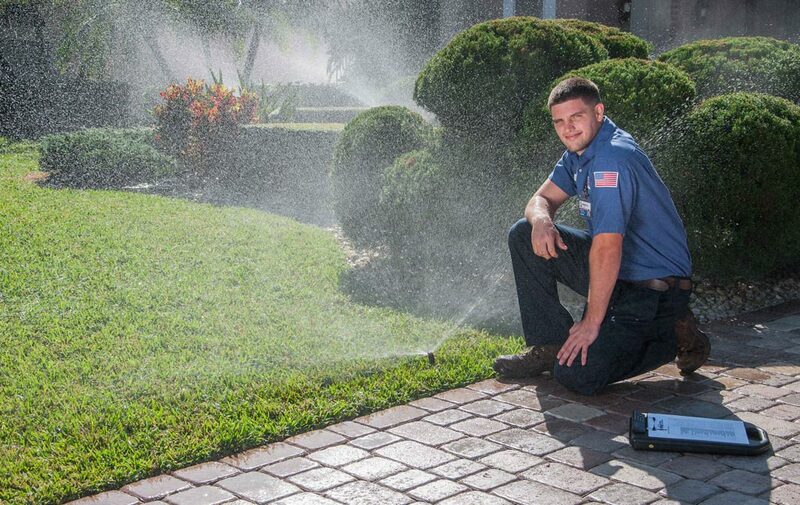 Servicing all of South Florida, our certified licensed technicians are the most capable people to handle lawn and garden sprinklers and irrigation systems. Art Plumbing, AC & Electric will send a licensed lawn sprinkler technician out to your home or place of business for a review of all head patterns, spray patterns and location of all sprinkler heads to achieve proper coverage. We will also make sure your time clock is properly set. Call Art today to schedule your Wet Check at 1-800-475-1504 We pride ourselves in the high-quality professional service we provide at a reasonable cost. With six great plans to choose from, our yearly lawn sprinkler maintenance plans include labor, repairs and replacement of equipment and parts for your existing lawn sprinkler system. Damages caused by landscape maintenance companies are included in all plans. Protect your landscaping with one of our convenient maintenance plans for your total peace of mind.